We have had Simba for 15 years and he has been a wonderful dog adjusting to changing conditions as the base of the family moved to Singapore in 2007 as recorded here. A year ago, just before the Chinese Rabbit New Year of 2011, I had put Simba with a friend's family home in KL that had become his new home as I was travelling out of town too often. All was well for Simba until the new Year of the Dragon started. We were all in Singapore and our friend's family had also left for Singapore to celebrate the Chinese New Year, leaving their maid at home. After the third day of the celebrations, I got an sms message that said their maid informed them Simba had gone missing! I had rushed back to KL to try to comb the area to look for Simba. Over a week had gone by with no results and I decided to put out several signs in the area for help from the public. The post is embedded below or can be seen in facebook by clicking here. Click the comments icon above to read the many views shared by concerned friends. Many friends shared their concern for Simba and one even commented, as recorded above that "...sometimes the dog loves the family so much that they don't want the family to see them die. So they go missing "
From the 'Lost Dog' sign I had put up, one resident called up while I was in Singapore again to say his son had spotted a black dog with a collar that looked lost in the previous week. He wasn't sure it was the same dog as I had not put up a photo. I referred him to our family blog photo on the website and he later confirmed that it was the same dog. He told me he was a dog lover himself and surprisingly shared the story that he once had an old dog too that seemed to have a tendency to want to run away for reason of knowing it was near his end of life! This was similar to what our facebook friend had shared that the caller was unaware of. Simba was last seen by the boys who came to KL during the December holidays. Simba was even introduced to the new puppy Ray had found in Penang. Here is Han and Shuan playing with Simba, not realizing then that it could be the last time they would see him. The other members of the family had seen Simba a longer time ago on Jan 2010 when Fei had returned home from Beijing. This was the time when Simba had a new assignment working as a guard dog in a warehouse. 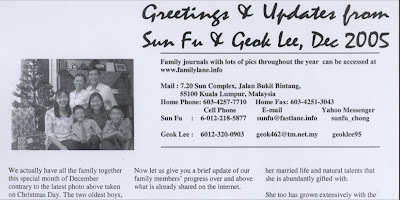 Su probably is the one who hasn't seen Simba the longest as per the photo above taken on Dec 2006 when she returned to Kuala Lumpur from the US for a family Christmas reunion before her mission. I even resorted to checking with the R.S.P.C.A in the hope that someone who found Simba as a stray with a collar might bring him there. .... but when they turned around, it wasn't Simba's face! .... seeing a dog that looked like Simba but was far too young to be him! The RSPCA staff tried to persuade me to take one of them that looked like Simba. I would really love to but I already had a new puppy picked up by Ray to care for. The dog lover who responded to my notice had given me the latest clue as to which area Simba could possibly have disappeared to. This inspired me to continue the search even on Valentines day to find Simba! I combed rubbish sites in nearby areas where Simba was reported to be seen as this would be likely sites a stray would get to find food. .... but it didn't look like Simba when the dog turned around! A puppy has fallen to my hands to be raised and trained in KL as recorded in an earlier post. While I'm out of town, the puppy Ace would be kept in our old home in the indoor garden where he had shelter, space to run and a pond full of water with ample food provided. He has been doing fine when kept in the indoor garden but not too long after Simba was reported missing, I had let him out to wander in the outside garden. Ace tried to go under a gate with aluminium sheets and cut himself on his upper neck! I stopped the bleeding with a roll of toilet paper and rushed him to the animal hospital. The deep cut of about 3 inches long and an inch wide didn't seem to bother the puppy at all! The puppy is already about 4 months old and is growing fast with more stories to come. Meanwhile we are still not giving up with finding Simba just yet! The story of Ace, sadly the last one, continues by clicking here.